Two words for you: laser tag. Anyone who didn’t celebrate their milestone-birthday-whose-number-shall-not-be-named by playing laser tag really missed out. You will not find a finer group of laser taggers than this crew. I knew I wanted to do something different for my birthday this year and after much deliberation, I settled on laser tag. 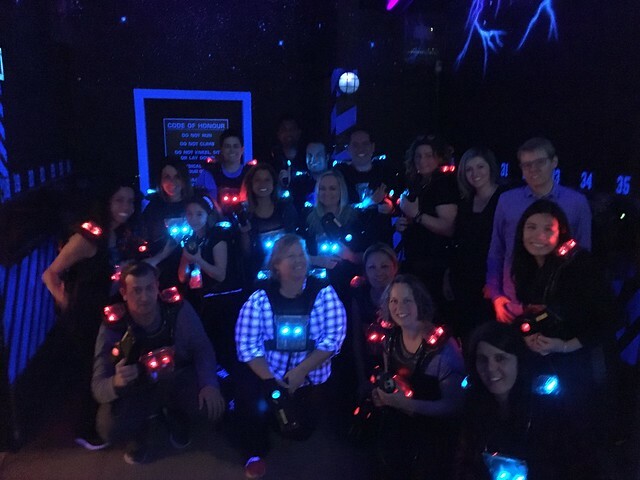 I hadn’t played laser tag since high school, but I remembered it being really fun and also, it seemed like something epically ridiculous to do for my birthday. And hence, I scheduled two private games of laser tag (or should I say “lazer” tag) at the laser tag place in New West and gathered a group of peeps who were up for the challenge of spending an hour shooting at each other in a dark labyrinth. The first game was a free for all, where it was every man, woman, and child for themselves. In this game, I learned that I have terrible aim and was very glad that there is no cost for ammo when it comes to laser tag. In the second game, we were put into two teams and your objective was to only shoot people on the other team while not shooting people on your own team. As it turns out, Team Red’s strategy of strategizing bested Team Blue’s approach of not strategizing. Who knew? Despite my poor performance, I had so. much. fun! It was even more fun than I remembered it being! Everyone else was also raving about what a blast they had too (even a few who had been skeptical before the game), which made me very happy! After the games were over and we all had a chance to examine our score cards in detail1, we headed over to my place for the after party, where we (along with some other peeps who weren’t up for (or available for) laser tag but who were up for partying) ate, drank, and were merry into the wee hours. As usual when it comes to parties, I didn’t get nearly enough time to chat with anyone as much as I wanted to, but I did really have a great time and was reminded that I have the best friends ever. Thanks to everyone who came out to celebrate with me. And if anyone wants to go play laser tag again, I’m game!